When you're not registered at the dentist getting an appointment is like finding a needle in a haystack, and last week I managed to get not one, but two! A double booking for me and my little boy, who now has 12 teeth pearly white teeth poking through, which is crazy considering he only had four when he turned one! In all honestly I wasn't really looking forward to our appointment - I'm not the biggest fan of going to the dentist myself, but having a feisty toddler in tow really didn't seem like it would be fun. I decided to take Zach's baby car seat with us, so that during my check up I could strap him into it so he wouldn't be running around and causing chaos. I attached it to our pushchair which meant Zach walked with me the whole way there which took forever as you can imagine! When we got to the surgery I was trying to sign us in but a certain toddler had other ideas and kept trying to run out of the building or climb the stairs. I felt like everyone was watching me trying to control him, and I get so flustered in those situations. I know Zach doesn't understand that he has to stay still when I ask him to, but I could really have done with an extra pair of arms in that moment! Thankfully he happily sat in his car seat in the waiting room and played peek-a-boo with everyone else there, and then behaved impeccably during his own check-up. 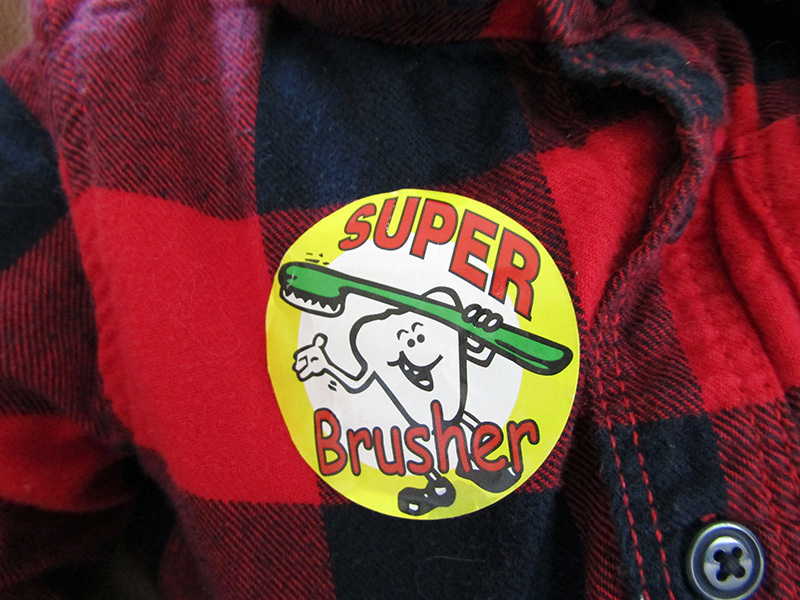 The dentist was happy with his teeth which was a relief, and he was given a sticker which he proudly wore for the rest of the day. My check-up went less smoothly as not I was told I need a filling (boo!) and Zach whinged and cried whilst trying to escape from his car seat. After my x-rays were checked we were free to go, and I've decided that next time he needs an appointment we are going to go as a family so one of us can distract Zach at all times!